As of October 1, students can no longer take out federal Perkins Loans to help them pay for college. The government’s oldest federal student aid program, established in 1957, ended Sept. 30, after Congress failed to extend the program. As a result, up to 500,000 eligible students at 1,500 colleges will no longer be able to take advantage of this financial aid program. As of October 1, the Free Application for Federal Student Aid (FAFSA) is now available for families and students applying for financial aid for the 2018-19 academic year. Current high school seniors as well as college freshmen, sophomores and juniors will need to fill out the FAFSA to receive federal financial aid for next year. If you want to have a chance at receiving free tuition at a SUNY or CUNY college this fall through New York’s free college program, you’d better get moving. The deadline to apply for the Excelsior Scholarship is July 21, 2017, so you must apply by then in order to be eligible. With college being such a large investment, it’s important to have a good idea of how much money you’ll likely be making once you graduate. Knowing the starting salary of your college major can help you determine your future ability to repay student loans and help you make smart decisions about paying for college. This infographic from Forbes shows which college majors pay the most–and the least–right out of college. A few years ago, the government reformed its Parent PLUS loan program and tightened credit standards for issuing loans to parents to help pay for college. While this reform may have reduced predatory lending, it may have had an unintended negative consequence as well: reducing the number of black students in college, according to a new report from Hechinger Report. While college is extremely expensive, there’s a lot of free money out there going unclaimed. In fact, according to a new analysis by NerdScholar, U.S. high school graduates left over $2.9 billion in free federal grant money on the table last academic year. How’d they miss out on the free money? They didn’t fill out the Free Application for Federal Student Aid (FAFSA). The Federal Pell Grant program was established to help make it possible for low-income students who may have not otherwise been able to afford a college education to do so. Unlike loans, the grant does not have to be repaid, which helps reduce the burden for students who receive the grant. 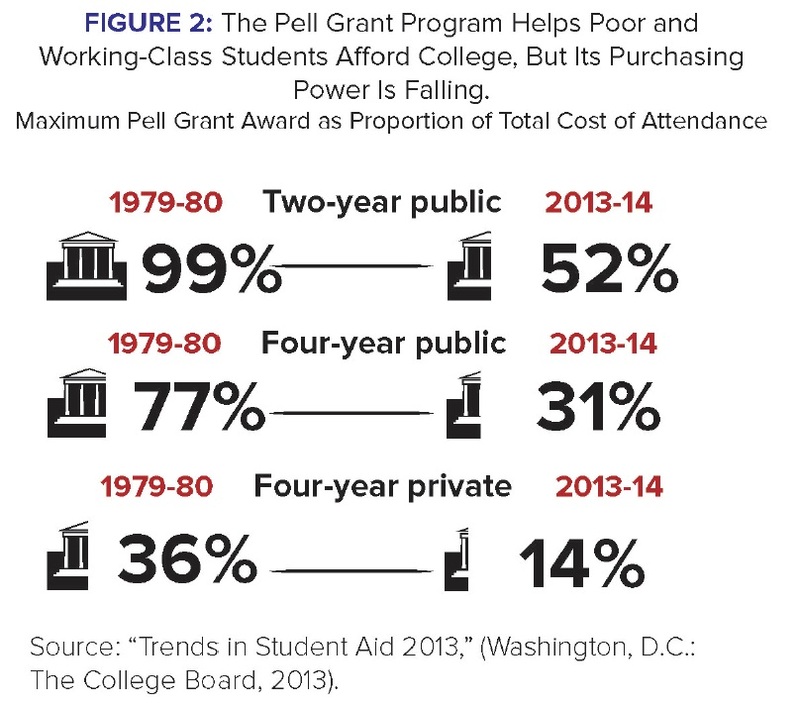 As college costs have risen, the maximum federal Pell Grant has risen as well–but not nearly enough to cover the huge increase, Inside Higher Education reports. According to a new report from the Education Trust, New America Foundation, and Young Invincibles, the Pell Grant program is failing to keep up in providing low-income students with access to a college education. Who should get financial aid? In his recent trip to nearby Buffalo, Syracuse, and Binghamton, President Obama revealed his new plan to make college more affordable. This handy infographic from the White House explains the major reforms and initiatives the President hopes to advance in order to hold colleges accountable for providing a quality education, encourage schools to use technology to cut costs, and make it easier for borrowers to repay their student loans.